Press Release: The title is direct, “Would you deliver an electric shock in 2015?” and the answer, according to the results of this replication study, is yes. Social psychologists from SWPS University of Social Sciences and Humanities in Poland replicated a modern version of the Milgram experiment and found results similar to studies conducted 50 years earlier.The research appears in the journal Social Psychological and Personality Science. The good news from a study last year: Matthew Hollander listened to all the Millgram recordings again, and there were about 800 in the full set. He found that even among obedient people there were signs of resistance as the experiment got more painful. They had ways of slowing the experiment, tried to talk their way out of it, and talk to the victim too. The difference was that the disobedient people were more aggressive about slowing things down, they started to resist earlier, and had more options to resist. It would seem likely that if we train people better, a lot more people will stand up to authority. Most often, stop tries involved some variation on, “I can’t do this anymore,” or “I won’t do this anymore,” and were employed by 98 percent of the disobedient Milgram subjects studied by Hollander. That’s compared to fewer than 20 percent of the obedient subjects. Interestingly, all six of the resistive actions were put to use by obedient and disobedient participants. If people could be trained to tap practices for resistance like those outlined in Hollander’s analysis, they may be better equipped to stand up to an illegal, unethical or inappropriate order from a superior. And not just in extreme situations, according to Maynard. Though the numbers do still look depressing. There are critics of the Millgram experiments, who say that it was an artificial setting, unethical, and people wouldn’t react that way, but this second round of research has replicated at least some of those findings. There have been variants, which I remember dimly 50 years after being introduced to Stanley’s nastiness, where the groups are exposed to various kinds of persuasion & leadership to not inflict the shocks before the experiment. I’d suggest these courses might be more interesting in a ‘persuasive media’ world than mere repetition. Milgram’s basic work has stood as well as Pavlov’s – but pure operant conditioning doesn’t involve the experimenter’s authority, active or implicit. I sy this noting that draconion energy rules against fossil fuels inflict pain on third world places hoping to develop, yet there are those who both advocate development yet gladly inflict the pain (both only proposed). I’m not sure the mechanism is the same, but it might be…? AS I say, I’ve not studied in many years, so there may be research that goes beyond merely calling this cognitive dissonance. But what if you knew that the “subject” was non-normative, or maybe just an Abbott/Trump supporter? What if you’d been “trained” through modern Western education? I agree. Modern education has been “redesigned“ or “improved“ to reduce and/or eliminate “non-normative“ thinking. NO NO No. Execute Climate Deniers! What if you’d been “trained” through modern Western education? You don’t need to be trained through modern education. Modern life does a better and more thorough job. We have had over two hundred years of accepting, believing and being educated in the evils of modern economic dogma so we have been well trained to hurt anyone whom we are told to by any figure of authority. Superbly trained. So why should this come as any surprise? We currently live in a world where the economic dogma and the execution of that dogma surrounds us and includes us in a continuous Milgram Experiment every day of our lives. The pain may not be inflicted by electric shock but is by economic shock and dislocation. The big land owners throughout history have been particularly vicious. Don’t believe me? Think about the “crime of being poor,” the nineteenth century Poor House (UK) as one example, the Luddites getting such a bad press (and their persection) when they fought for Living Wages for weavers are another example. The attitude of the modern governments to those who are unable to find work has not advanced very far even in these supposedly enlightened times, and I speak from personal experience. George, Henry, 1883 Social Problems Robert Schalkenbach Foundation. Read online. The US also had and has its own cruelties. Harrison, Fred 2012; The Traumatised Society How to Stop Cheating and Save Our Society; Shepheard-Walwyn, ISBN: 9780856832871. All three books are available from the Robert Schalkenbach Foundation, a charitable organisation. Prices are USD. Miller’s and Harrison’s books I have also found on Amazon.co.uk both new and second-hand. Welcome to the Real World of the on-going and Continous Milgram Experiment. Heh, my keyboard hasn’t let me down. Dr Miller was the Professor of Epidemiology at the a researcher at the London School of Medicine. Dr Miller was the Professor of Epidemiology and a member of the Research Council at the London School of Medicine. Sorry. I’ve had words with my keyboard but it hasn’t listened. Of course the citizens of SA are safe from such experiments. Attempting to shocking the (actor) victim with electricity has to carry an additional randomize factor that ruins the experiment’s (statistical) outcome. Of course this leads to the conclusion that the good citizen of SA are immune from the Milgram effect, or at least that is what these citizens believe the local authority has led them to understand. Given half a chance South Australia is going to put it’s tongue on some Tesla Powerwall batteries… Hmmm taste the rainbow. Put its tongue on something Musky? They were only under orders Craig. Under orders was for those the Japaneses soldiers perceived to be from a much higher authority. And that could be viewed as not so dissimilar from the Craig Thomas’s of this world who surrendering rational thought to the authority of UN-IPCC crowd? But the purpose of Milgram Experiments was to prove that most people are seriously dumb. It has more to do with groupthink and respect for authority than lack of intelligence. Academics in other fields, bright people no doubt, but they accept the paradigm on climate change because they are ignorant of the science. Journalists and politicians fall into the same category as ordinary folk, compliant and accepting. What were the ages of the people tested? I wonder if age, experience, and maturity matter? The press release said 18 to 69, 40 men and 40 women. It was there in the text. With this electric shock experiment, I wonder if they failed to press the button to deliver the shock, whether if they were shocked instead, would they be so hesitant? The supposedly good “Nazi” Albert Speers noted that in WW2, communications at a distance didnt allow questioning and it was used to commit atrocities, as orders came from “higher up”. That distanced those who might question authority. The same thing going on today with the unquestioned global warming science by some who cannot think for themselves…..
Thw Asch (Conforming to perceived majority views) and Zimbardo (adopting authority roles in fake prison) experiments also have relevance to the warmist psychology. It kind of implies society is one large open air prison for the mind…. Either that or people have been thoroughly brainwashed through passive agressive measures through the media. Make all the zombie movies all the more relevent…..
never go up,’ a Catalan saying. your Hasidic Jews in New York, trading on the basis of verbal agreements, that’s the cultural basis for strong societies. We saw the movie about Milgram’s tests called Experimenter last year, Milgram was influenced by the events of the Holocaust, especially the trial of Adolf Eichmann, in developing the experiment. He initially wanted to do the tests in Germany to gather data on its population regarding the willingness of people to commit terrible acts versus their nationality, after conducting trials in the USA he was stunned to have found what he was looking for in his own country. I am wearing a white lab coat as I write this comment. I am skeptical of anthropogenic global warming. I am authoritatively rejecting the authority of climate science. Of course currently the UN would encourage everyone to move on from Milgram effect to Stockholm syndrome. OT , I see the great barrier reefs bleaching damage is so bad its unrecoverable , according to their ABC . I have a new name for renewables , PARSITIC , yes it’s a parasite , needs to feed of another to survive or exist and this describes wind and battery power to a tee . The authorities should just rip out the dead stuff and replace it with a large shipping channel. Dont you mean replacing the energy ministers? Not really. For politicians, attack is seen as the best form of defence and Jay Weatherill surely needs to defend his policies, his government and his own seat. It happens this time every year. It has something to do with summer being warmer than other seasons and the cycle of Research Grant Applications. There’s one closing in 8 days, but it takes 6 months to fill out the paperwork. As usual people will queue up behind someone who appears to have authority, whatever the matter and whatever the authority and then follow like good little automatons, relieved no end to be free of the responsibility to think for themselves. Or is that an unfair characterization of the way people behave? Probably not. But you be the judge. I don’t want the responsibility to think for myself either. On the other hand, do unto others as you would have them do unto you doesn’t require much thinking. But my million ‘friends’ on farcebook confirm what you say is wrong — so there! Have you really a million friends? But no matter. In my brief career as a proud Facebook account owner one thing about Facebook has become obvious, Facebook tends to encourage trivial level discourse. But I will readily admit that some engage in more serious examination of events and their meaning. Nevertheless, if your million Facebook friends tend toward the average it’s very hard to agree that they prove anything. We already knew that people are easily conned into becoming non-thinking drones so such experiments are redundant. Just read the daily news to see the proof. That should work out better than my present pension! Another interesting feature of inbuilt human behavior is the birth order effect. There was a book that I read almost 20 years ago that looked at the French Revolution from the perspective of birth order in families. Using examples from this very difficult part of history, the study showed that first borns tended to wind up on a different side of the mess to their siblings. Numerous family splits were illustrated and the conclusions drawn to suggest that how we will react in situations can be a function of early conditioning. That said, there are an awful lot of people just in it for the money. The book may have been Born to Rebel by F Sulloway. 1996. People too easily accept the expert opinion, because there are many experts on who we rely. For instance a family doctor, or a surveyor, or a lawyer. But all these have professional qualifications in a proven body of knowledge, and ethical principles that they have promised to adhere to. The climate alarmists have no demonstrable body of knowledge, nor any proven competencies. In fact, in short-term predictions that would suggest emerging climate cataclysm the climate community have had zero success. Empty vessels make the most noise that cons gullible people to believe in anything. For example if enough of them make noises often enough that the earth is flat guess what will happen. A lot more people will believe it and the Flat Earth Society will become very popular. The lack of critical thinking is mostly due to the way kids are taught at school. I thought they had a body of evidence & a moral high ground to preach from. In the blind tests we assume that the appointed experts in lab coats are real. But in the world of climate, there is no clear distinction between a genuine expert leader in the field and a proclaimed know-all who has can repeat a few formulas and spout a lot of nonsense. But, in the real world, when adopting wide-ranging and extremely costly policies on the basis of claimed experts, should not be policy-makers have a duty of care to the people they serve in treating the climatologists like expert witnesses? This from the Business Dictionary might provide a guide. Admissible testimony relating to a professional, scientific, or technical subject. Expert evidence is based on formal and/or special study, training, or experience that imparts the competency to form an opinion upon matters associated with that subject. It is the duty of the authoritative expert to present the necessary scientific/technical criteria to enable a court to test the accuracy of its own conclusions and to form its own independent judgment of the evidence. Before given the permission to state their opinion, the ‘experts’ are usually questioned by the court to evaluate their qualifications and experience in the subject. Proper application of this criteria would mean that the next IPCC report would have to be abandoned. Note to self: buy white lab coat. Might make son and cat more obedient. If you are going near the ocean, ensure that the lab coat you purchase is acid proof. I saw them clearly at the fishmongers – fish with acid burns! I have my dad’s white coats from ~ 1922. Did not know this was possible. Should have been done ages ago for multiple reasons. Goes to show our politicians are asleep at the wheel until they hit the curb. Next time though it could be a cliff. The Snowy scheme finished in 1974. The delay since then is just the standard reaction time in Canberra (unless you use a sharp stick). Trumble could really set the cat among the pigeons if he also brought the below Gordon dam project to the fore. Cancelled by the greenies and old leftie Hawke with the help of the RAAF, it could theoretically help to offset the loss of Hazelwood. That of course is making a lot of assumptions about Hydro Tasmania’s water, but assuming a future loss of industry on the Apple Isle, a constant 500MW across the ditch might be conceivable. Of course there is no justification for the cost of this sort of reaction. Far less expensive to leave Hazelwood be, or even to build a coal fired facility in the Fingal Valley. However the inmates running the asylum have no understanding of the time value of money. “The unprecedented expansion will help make renewables reliable, filling in holes caused by intermittent supply and generator outages. In 2012, Snowy Hydro in conjunction with Essential Energy decided that a redundant substation above Lake Jindabyne was to be decommissioned. Snowy Hydro undertook an environmental assessment of the proposed decommissioning works and worked with the Kosciuszko National Parks officers to ensure the removal would be carried out to the highest standards. with the surrounding National Park and provides similar habitat. This work was finalised in June 2015 and all requirements were met. Looking forward, the removal of the substation and associated infrastructure including oil filled transformers has reduced the environmental risks that were posed by the site. The re-vegetation of the site has already provided a much improved natural outlook and this will continue to improve over time. Frydenberg and Weatherdill just went toe to toe during a press conference , was amazing to listen to . Just looked at the AGE online description: couldn’t have happened to two nicer people. Progress, but we need more such cracks in the edifice of Renewable Self Aggrandizement. Can never work out which comes first, the Money or the Power. For the average voter though it looks sure we will have less power and less money after they are done. Jay said Josh and Mal show signs of ‘white knuckled panic’. He would know how they feel. For those who don’t understand Australian politics, groupthink is not such a bad thing when its going your way. The PM chose Josh Frydenberg to be the environment minister because he is an empty space when it comes to climate change. In December he tried to organise an inquiry ostensibly to eliminate Abbott’s Direct Action and replace it with a punitive tax, but there was a backbench revolt and he had to back down. The government is suffering from cognitive dissonance and looking vulnerable. The Dutch have a GREEN LEFT party. That would be worse than a few thousand volts applied to your private parts. If government + establishment wanted to make us believe in on-going alien presence and contact in Antarctica, they could do it. It would begin with admitted uncertainty and the need for open debate. Certainty would mount and the time for debate would be declared over. Look, I think I’m exaggerating wildly. It’s just that I’m no longer sure I’m exaggerating wildly. Its a Hollywood blockbuster with ‘deep state’ overtones, quite believable. I cannot confirm or deny the rumour of an alien base in Antarctica, but I’m confident they are aware that ENSO is the main driver of temperatures and climate on the planet. Hopefully they will enlighten us on the mechanism. What do the Experts (Your Colleagues) Recommend? New Jersey’s Taterka recommends sticking with proven, peer-reviewed scientific resources. you name it: CAGW caused it. “More than 97 percent of climate scientists have concluded that human-caused climate change is happening,” the report states. Here is a paper these folks have put out on health hazards of climate change. This is scary stuff as they use Cooks 97% to argue from authority that dangerous climate change is a fact and their doctors need to address it with patients and in their diagnoses. Their “facts” come right out of WWF propaganda and they claim membership of over half of US doctors. I have no idea what to do about it but I see this as dangerous misinformation being disseminated by a very trusted group. I wonder if Doctors for Disaster Preparedness are aware of this-they seem to be pretty well grounded in facts and common sense during the videos of presentations to them by skeptics. James Mattis’ unpublished testimony before a Senate panel recognizes a threat others in the administration reject or minimize..
President Donald Trump will find the job of reining in spending on climate initiatives made harder by an Obama-era policy of dispersing billions of dollars in programs across dozens of agencies — in part so they couldn’t easily be cut. The Obama administration’s approach will be tested by Trump’s first budget request to Congress, an outline of which is due to be released Thursday. Trump has called climate change a hoax; last November he promised to save $100 billion over eight years by cutting all federal climate spending. “The climate funding has spread to almost every aspect of the federal government with sometimes wacky results,” said Morano, who doubts global warming and runs the website climatedepot.com. He cited one example of a Department of Transportation query about the link between climate change and fatal car crashes. Others argue that the spread of climate programs throughout the federal government simply reflects the evolving nature of the risk. 2 metres of snow in the Sahara. Now you won’t see that in the SMH or the Age or on the ABC. Having been to the area, the Sahara (Arab for desert) makes Australia seem temperate. The heat is incredible, coupled with the total lack of water or humidity. You need to continually drink water. So I would have thought 2 meters of snow was newsworthy. and while you are spreading fake facts, any denial of the ABC being the first radio news to headline the blizzards in NE USA days before they occurred? ie they were reporting the forward alerts at the head of the news. Whoa there. Two different events, a month apart! One thing that doesn’t seem to be considered in these experiments is people’s innate desire to control others. When the opportunity exists, and a convenient excusing rationale exists, most people will do their worst. The excuse of “obeying authority” is just that: a convenient excuse. Look at any political demonstration. The “fact” that many demonstrators just want to wreak havoc is buried under their excuse that their opponents are “evil”. So a authority figure, or a “higher morality” provide the excuse for people to do what they want to do. It is interesting I suppose, in a psychological sort of fashion, to observe trolls madly commenting on an old thread. They seem to enjoy muttering away to themselves. It must make them feel important. There is some numbskull doing precisely that at the moment on the last thread. Interesting psychology, and an interesting commentary on the medium, that an old thread is 48 hours old from inception. What if someone just stumbled on it after 5 days, noted that it was only a third of the way down the recent threads, and had some insight to add. They’d be ignored because the readers of the blog either don’t deign to read old threads or their limited attention span means that they would not be able to cope. I have just watched the Freydenburg interview interrupted by Weatherdill. It is a pity that Jay Weatherdill and Penny Rong split up – they are made for each other. As thick as 5 or 6 planks. He is upset that people are trashing SA. He is the one who has trashed SA. Even the ABC is a little less than enthusiastic. Comment heard as I drove along the lines that Weatherdill has done this regularly and generally does well out of “Us v nasty Canberra-ites”. Mentioned that the election was due in exactly 12 months (How long Oh Lord). In any other commentator I would say ‘distinct signs of scepticism’. A panic attack maybe, over the realisation that voters are no longer accepting renewable energy propaganda and his government has no quick fix before the next state election? The only thing missing was a whack with a handbag, she surely doesn’t mince words does she. “The right’s refusal to accept the authority of climate science is of a piece with its rejection of mainstream media, academia, and government, the shared institutions and norms that bind us together and contain our political disputes. This one must be an exception. After the fall of the Soveit Union in 1990, I travelled back to my parent’s home country to meet with family that I had never met before. I have a cousin there, only a few months older than me, so we had interesting discussions about our parallel lives. At one point, he reprimanded me as being too critical of a particular action that he had taken. He claimed, quite rightly, that growing up and living in Australia I was not exposed to the harsh realities of supporting oneself and one’s family under a harsh political regime, and had no right to preach from the moral high ground, not having been exposed to those realities myself. 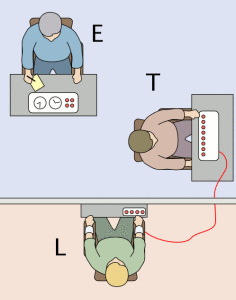 Similar to the Milgram experiment described above, there have been other experiments to determine how ‘moral’ people are in certain situations, when there is no one to observe and report any amoral behavior. As I recall, the majority of persons acted ‘morally’ if there was a risk of getting caught and shamed if they behave otherwise. In ‘The Seven Pillars of Wisdom’, T. E. Lawrence describes how easily a civilized Oxford educated person can lose his ‘thin veneer of civilization’ and gleefully participate in a killing frenzy. So it may be that most of us really do not have a clue how we would behave under different circumstances until actually put to the test. It reminds me of the crimes for which the Irish were sentenced to ‘transportation’ to Van Diemens’ Land. Starving people arrested for theft of a potatoe, and sent off on a dangerous voyage. Yet the aristocracy were scared sh*tless after the French Revolution. How would you or I behave if we had been in Ireland in the early 19th century? What would you or I do if we were a magistrate in that era? The father of the population control movement, Paul Ehrlich, told a Vatican conference that he thinks Pope Francis is “the person in the world [who] has done more” than others to “initiate work” to fight climate change. However, speaking at the Vatican on February 27, Ehrlich praised the current pontiff. The Trump administration is expected to propose steep budget cuts at its parent organization, the National Oceanic and Atmospheric Administration. A four-page memo outlining the proposed cuts, obtained by The Washington Post, showed a $60 million cut for the Weather Service. U.S. environmental group the Sierra Club has asked the Environmental Protection Agency’s inspector general to investigate whether the agency’s head, Scott Pruitt, violated internal policies when he said he did not believe carbon dioxide was a major contributor to climate change, according to a letter seen by Reuters on Wednesday. “It’s pretty unprecedented to have the head of the EPA contradicting basic scientific facts,” Sierra Club Senior Attorney Elena Saxonhouse told Reuters on Wednesday. Man is a pack animal. While there are fights for the alpha spot, it is not among the entire pack, but a select few. There will always be more followers than leaders. What scares me far more than the outcome of Milgram’s experiment was the outcome at Jonestown – but then that was no “experiment”. There sure are a lot of dots to connect between Milgram’s experimment, Jim Jones, Islamist suicide bombers, Lysenkoism, the radical left and the “climate movement”. At this point I just want to throw all those dots on the floor at Delphi and let someone else finish drawing the picture, maybe they’ll come up with a better one than what I’m seeing. The author of the linked piece returned to the original data, recordings etc.. from Milligan’s experiment. While not quite ‘junk’ science, it was pretty close. And the new group that replicated this? Perhaps there was coercion and bullying, was it really that different to what occurs in parts through society today? It is still chilling that people responded to coercion knowing that they were doing an experiment (even if they didn’t understand what the experiment really was). How ’bout, ‘throw da damn switch or die!! No coercion at all, only a desire to survive! Ifin you don’t survive you cannot destroy dem! While the context of this experiment may be a little unreal, it is still a good thought provoker. The very act of administering electric shocks was seen differently when this experiment was conducted, most people would have carried an image of the “electric chair” and so affected the approach taken by each of the subjects. My wife reported a test she undertook as a uni student. A group was asked to determine the longest of a set of lines. Unknown to my wife, EVERYONE except her was a tester, and they insisted that her (correct) choice was wrong. When she resisted, arguments were made to convince her. The main point was to test the effect of peer pressure – and my wife is as obstinate as I am! So, maybe it’s only the obstinate skeptics such as us readers who can resist the “Sky is falling!” narrative!